As chairman of the Warkworth A&P Society for the last few years – nobody else appears to be willing to put their hand up – I should be used to the frenetic lead up to the Show, which involves last minute trade exhibitors, arranging someone to mark out the show grounds which for the rest of the year are the Mahurangi Rugby pitches and making sure everything else is under control including money in the bank account to cover prizes. But this time was a bit different because Marjorie Blythen, our Secretary of more than 30 years, had retired after the 150th Show and, for all of us, it was a whole new challenge to remember critical things that previously appeared to happen automatically. Fortunately there is a good committee able to take responsibility for each section. Equally fortunately, our new Secretary is Penny Webster, previously President of Auckland Federated Farmers, ACT MP, Mayor of Rodney and most recently Auckland Councillor. Her relationship with Auckland Council executives and local businesspeople has proved invaluable, but there are so many moving parts to an A&P Show that depend entirely on careful planning and, in case of problems, urgent remedial action. Everything comes inexorably together on one day of the year and there is no second chance. At 9.30 there was a phone call from the farmer supplying the sheep for the shearing competition, asking why the truck was an hour and a half late to collect the sheep. After several panic-stricken phone calls, the supplier borrowed a truck and trailer off his next door neighbour and drove them there himself. All’s well that ends well, because in this case the Warkworth team that had won the previous week at Kaikohe performed well again, ably assisted by Jack Fagan who won the overall competition. This year ANZ Bank has sponsored a Northern Region shearing competition which has lifted the level of participation by providing meaningful prize money for the season. In this technological world, especially in an increasingly urban area, less than an hour from Auckland under normal conditions, but still subject to major hold ups and detours over the summer, the relevance of an A&P Show can be called into question. The land around Warkworth has gradually changed from pastoral and horticultural to lifestyle, subdivision and new motorway development, so we are no longer certain of a local community with any great sense of commitment to the traditions of the past. We have emphasised the lifestyle nature of the Show with ride-on mowers, dog demonstrations, Tai Chee and free children’s entertainment and waterslide, to attract the newer type of residents and younger families. 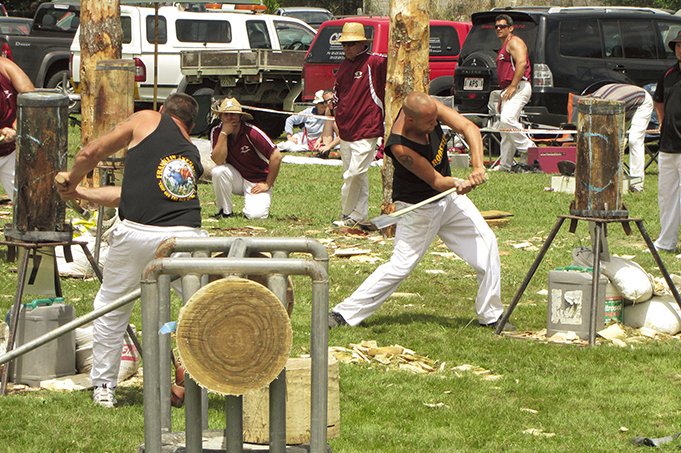 But it’s the traditional A&P activities like the wood chopping, sheep shearing, show jumping and cattle judging which still attract the crowds. There remains an apparent desire to see what an A&P Show is all about. The disappearance of sheep farming from the North means it is hard enough to find sheep to shear, let alone run a sheep competition which hasn’t happened for over 20 years at Warkworth, but sheep racing continues to attract an enthusiastic crowd. I’m sure every A&P Society has its own challenges putting on its annual Show, but equally many of the challenges will be the same across the country. Apart from increasing urbanisation, our biggest challenge is finding younger volunteers who are prepared to take over from an ageing committee and inject new ideas and energy into finding the recipe which will ensure the survival and success of an important, but evolving, part of New Zealand’s rural tradition. The next big challenge, certainly not unique, is to generate enough money to operate and takings from the Show don’t come anywhere near covering costs. Sponsorship by local businesses is essential. The values evident at the annual Show demonstrate the best aspects of this rural tradition to an increasingly urban audience. It is critically important to counter the negative view of farming promoted by activist groups like SAFE and Greenpeace and vested interest organisations such as Forest and Bird and Fish and Game. A&P Shows have the capacity to do this in a low key, but inclusive way which may encourage people to question the more stridently unjustifiable criticisms of these groups. A&P Shows are a local microcosm of our national identity with the capacity to bring urban and rural together for one day each year. They cannot fight all the negative publicity on their own, because the best weapon of all would be total avoidance of any animal cruelty or environmental pollution, thus removing the basis for criticism. But an annual event which promotes rural tradition and an area’s local history, brought together by community engagement, hardworking volunteers and local business support, deserves to survive. Long may the crowds keep turning up. This article appeared earlier in Farmers Weekly. It is here with permission.